Bell Telephone Laboratories used to run some pretty interesting advertisements in magazines back in the 1940s through 1960s that touted the many communications innovations coming from their scientists and engineers. They built what was indisputably the worlds best, most reliable telephone network. It, along with the Interstate Highway System, is credited for a large part of what fueled America's growth so significantly after World War II. 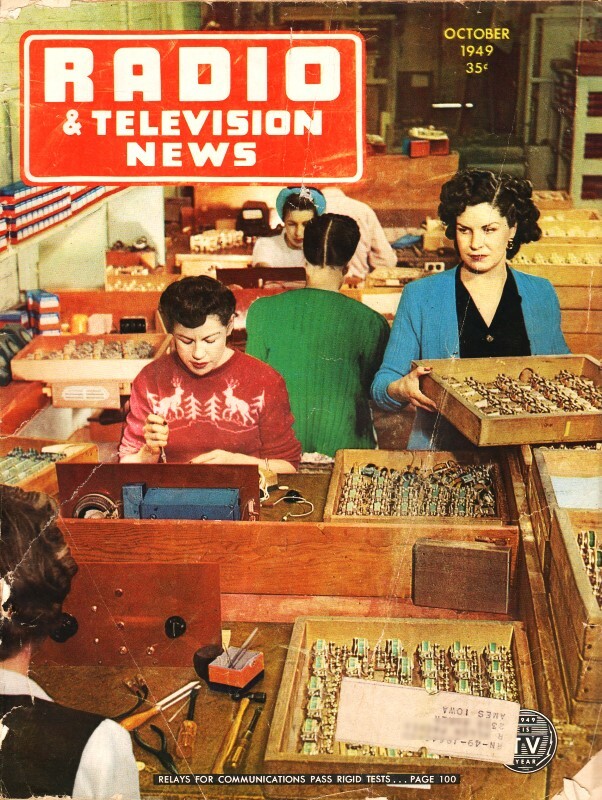 This ad from a 1949 issue of Radio & Television News magazine tells how repairmen used a specially designed sensor to trace out faulty phone lines by listening for a test signal sent out by the central office. What caught my attention about this ad was the uncanny resemblance the man in the photo has to Melanie's father - especially with the ball cap and glasses. She was amazed when I showed her the picture. Another thing the picture brought to mind was that the owner of an electric company (Simpson Electric Company) I worked for prior to going into the USAF landed a spot in an Ivory Soap commercial when they were doing a series of commercials featuring construction workers that depended on Ivory ("99-44/100% Pure: It Floats") to clean the grime from their hands and bodies at the end of a hard day. He finds trouble by ear. As this cableman runs his pickup coil along the cable, his ear tells him when he has hit the exact spot where unseen trouble is interfering with somebody's telephone service. 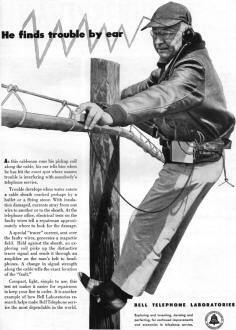 Trouble develops when water enters a cable sheath cracked perhaps by a bullet or a flying stone. With insula­tion damaged, currents stray from one wire to another or to the sheath. At the telephone office, electrical tests on the faulty wires tell a repairman approxi­mately where to look for the damage. A special "tracer" current, sent over the faulty wires, generates a magnetic field. 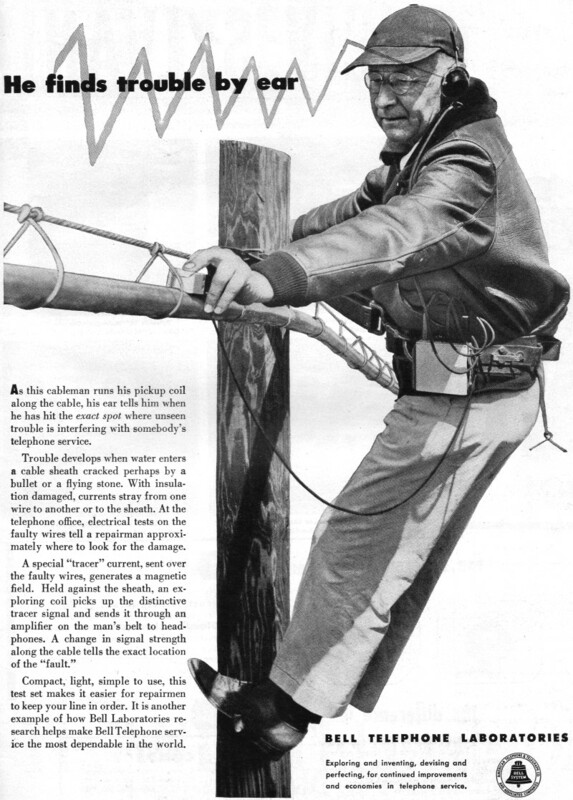 Held against the sheath, an ex­ploring coil picks up the distinctive tracer signal and sends it through an amplifier on the man's belt to head­phones. A change in signal strength along the cable tells the exact location of the "fault." Compact; light, simple to use, this test set makes it easier for repairmen to keep your line in order. It is another example of how Bell Laboratories re­search helps make Bell Telephone serv­ice the most dependable in the world. Exploring and inventing, devising and perfecting, for continued improvements and economies in telephone service.